IPhone 5 Launch Starts Today. Okay, for those of you who live in a cave or whatever, I thought I should inform you that the iPhone 5 has enjoyed a mega release today – September 21, 2012. The photo above this article, courtesy of iPhoneInCanada.Ca via CultOfMac.Com is a keeper. Although this is a picture from the FEDEX facility, it gives you an idea of what both FEDEX and UPS have had to contend with in order to meet the delivery requirements sent forth from Apple Inc. 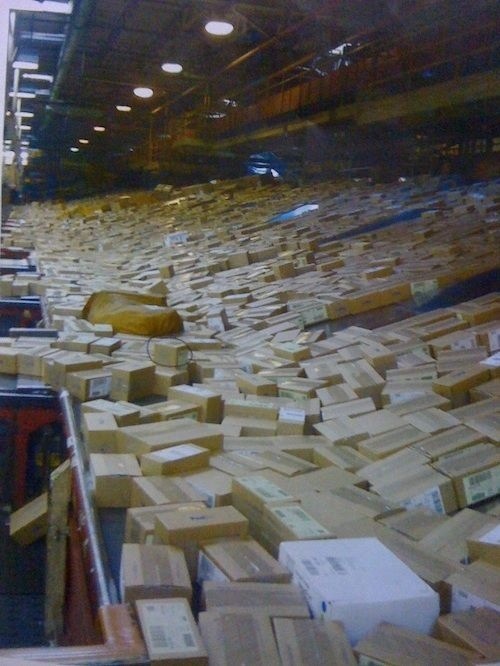 If you look closely enough, the vast majority of these packages are iPhone 5s. Wait, I think I see a couple of iPad Minis there. Ha – just messing with you! The parcel carriers were explicitly informed not to deliver any iPhones until September 21st, causing a bit of a backlog – albeit a well-organized one – for the delivery personnel. What looks like chaos in this picture is a well – coordinated system in progress. Many of the people on my Twitter feed have received their iPhone 5 in timely fashion, posting pictures of their personal unboxing experience and overall impressions. Due to a technical glitch over at Telus, I will not receive mine for another week – even though I placed my order well before the 4:00 P.M. deadline on September 14th. If someone over at Telus Mobility reads this, perhaps they can intervene on my behalf? I blogged about the glories of Telus – throw me a crumb! So, did you receive your iPhone 5? If so, post pictures, videos and/or first impressions in the comments section below. And, yes, I know the mapping is a mess, but it will get better. But, that’s another article. Apple iPhone 5 Event: The Number 5 Never Looked So Good. Do you have a birthday or anniversary on September 12th? A wedding? A newborn baby scheduled for delivery? None of this matters. Nobody cares because the world will officially stop as Apple unveils it’s much-anticipated, sure to be record-breaking in sales new iPhone – the iPhone 5. Media contacts were sent their official invitation with a great big number 5 on the cover. I received mine but I am scheduled for a hair appointment that day and will have to pass. Kidding! KIDDING! 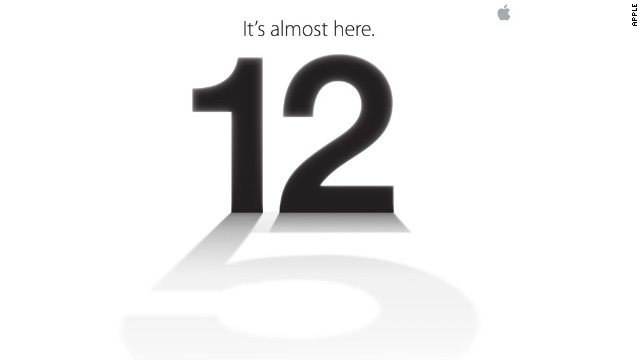 So, I guess it’s safe to say that, since the the number 5 is plastered on the cover of the invitation, the new iPhone will indeed be called the iPhone 5. Or maybe Apple is just playing with us and will release 5 products on September 12th. Now that would be something, huh? This probably won’t happen, though. I am hoping that the rumored IPad Mini and revised iPod Touch ( which will probably combined into one product) and retooled iPad 3rd generation will be released on the first anniversary of Steve Jobs‘ death – October 5th. There’s that number 5 again! However, maybe Apple has other plans to mark this important date. Time will tell. All I know is this – this Phone will shatter record sales like never before. It is the last project that had Steve Jobs full attention before he died and that alone will motivate people to grab this historic phone. And, with the implementation of iOS 6, a newly improved camera, 4″ retina display with in cell technology and more, this phone will climb more mountains and leap more hurdles than all the other phones combined. Are you excited? You should be! We are talking ground-breaking technology here!